Individual nanoscale nuggets of gold, copper, aluminum, silver and other metals that capture light's energy and put it to work are being employed by Rice University scientists who have discovered a way to build multifunctional nanoscale structures. The structures have an aluminum core and are dotted with even smaller metallic islands. The materials all sustain localized surface plasmon resonances, collective oscillations of the electrons inside the nanostructure that activate when light hits the particle. These nanoscale oscillations in electron density can power chemical reactions and even power reaction-promoting catalysts. The technique developed in the labs of Rice materials scientists Emilie Ringe and Naomi Halas uses aluminum nanocrystals as a base for size-tunable transition metal islands that enable localized surface plasmon resonances. 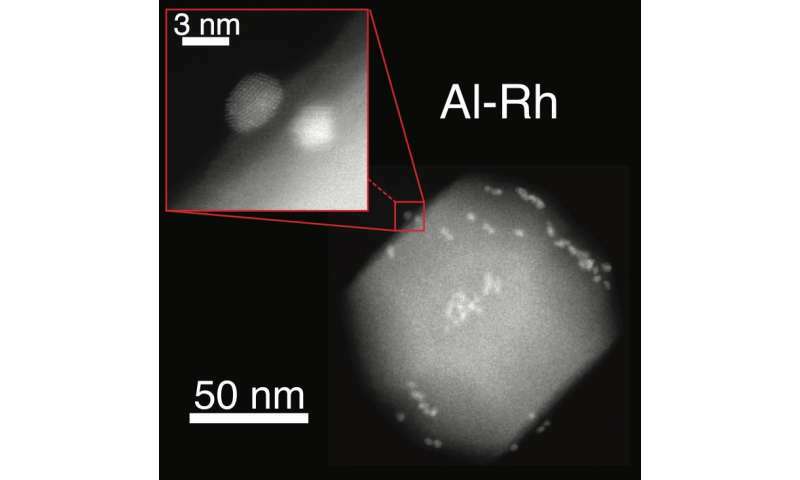 Aluminum is an effective plasmonic material, but adding smaller catalytic particles from three columns of the periodic table enhances the structure's ability to promote chemical reactions driven by light's energy, as shown in a previous collaboration between the Halas and Ringe groups. The technique allows for customizable surface chemistry and reactivity in one material, the researchers said. It could be useful for photocatalysis, surface-enhanced spectroscopy and quantum plasmonics, the study of the quantum properties of light and how they interact with nanoparticles. The researchers said their general polyol technique can be used to combine multiple materials in a simple, controllable process. Rice graduate student and lead author Dayne Swearer and his colleagues used a two-step synthetic method that began with the reduction of an aluminum precursor to purified aluminum particles between 50 and 150 nanometers wide. They suspended the particles in ethylene glycol, added a metal salt precursor and boiled the solution to reduce the salts that eventually nucleated and grew into nano-islands that decorated the surface of the original aluminum nanocrystals. The researchers found using an electron microscope that a 2- to 4-nanometer native aluminum oxide layer separated the aluminum nanocrystal and catalytic nano-islands. 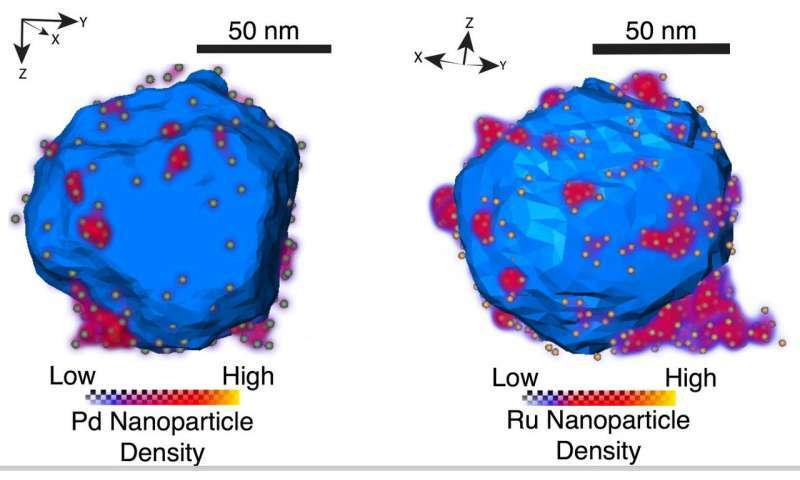 Additionally, in collaboration with Rowan Leary and Paul Midgley, material scientists at Cambridge University, the team was able to use electron tomography to identify the size and location of more than 500 individual ruthenium nano-islands on a single aluminum nanocrystal. "The naturally occurring nanoscale geometry of these new materials is really exciting," Swearer said. "Because a thin layer of aluminum oxide separates the two materials, we can independently tune their properties to suit our needs in future applications." The lab used the method to decorate aluminum nanocrystals with iron, cobalt, nickel, ruthenium rhodium, platinum, palladium and iridium. The islands were as small as 2 nanometers wide and as large as 15 nanometers. Custom-designed devices that couple aluminum and plasmonic islands will make sought-after reactions easier to trigger, Ringe said. In 2016, the team showed that aluminum nanocrystals decorated with palladium islands, made using a different method, could be used for selective hydrogenations when exposed to light that were not possible when simply heated in the dark. "We hope that with this new, expansive library of similar nanomaterials, many new types of previously inaccessible chemical reactions will become possible," Swearer said. The islands' small size makes them better at absorbing light than larger nanoparticles and also makes them better at producing hot electrons and injecting them into target molecules for catalysis, he said. "The synthesis could be used to make even more elaborate combinations of metals and semiconductors from the periodic table," Swearer said. "Each new material combination has the potential to be explored for several applications."